The following piece appeared in this week's Hafta, where I'm also now on vacation for about a month. Regular posting on this blog will also come down till year-end given chutti commitments. What will it take to get real-estate prices in the city down? If the Government was to be believed, increasing supply of land is one such measure. In fact, recent Court verdicts in the city are also expected to release large tracts of land for development. We take you through some of these key Government decisions and court verdicts, all of which are focused on real estate issues in Mumbai. 1. The Mumbai Mill Land Case - In March 2006, the Supreme Court freed up redevelopment of Mumbai's Mill Lands by holding that that the term "open spaces" does not include lands vacant after demolition. The interpretation of this term lay at the heart of a protracted battle between environmentalists and builders. The Supreme Court verdict which paved the way for mill owners to retain, and hence redevelop, a higher area of their mills, was supposed to have helped in raising supply of land and ease property prices. Blame it on bad execution on the part of the Government but nine months after the verdict, property prices in the Mill Land area, as well as in the suburbs (where prices were supposed to have crashed with land now becoming available in areas closer to the central business district) have only gone up. 2. Housing Policy – The first-ever housing policy released by the Maharashtra State Government last month was a directionless damp squib with the only key highlight being a move towards a transparent carpet-area based mechanism for land transactions. As discussed in an earlier Hafta piece, the Government, in what seems to be a naïve assumption, expects this move to bring property prices down. Another proposal in the policy provides for a higher floor-space-index (FSI) in Mumbai's extended suburbs, which again implies raising supply. Experts and planners do not expect any meaningful impact from the draft housing policy. And other than the Chief Minister himself, no one seems to believe that any measure in the housing policy will get real estate prices anywhere in the city to come down. 3. Repealing the Urban Land Ceiling Regulation Act (ULCRA) – A product of the Emergency era, the ULCRA, is aimed at enabling the Government to acquire surplus land to provide housing for the masses. While the Government has fallen abysmally short in this noble intention, builders, thanks to politicians, have found their way around the Act by using exemptions. Repealing the Act is also necessary for getting infrastructure funding under the Jawaharlal Nehru National Urban Renewal Mission (also discussed in an earlier Hafta piece). The Chief Minister expects that repealing the Act would increase supply of land in the market and hence get real-estate prices down. Yet again, the CM's theory has not found too many takers and experts and planners do not expect repealing of the Act to cool off real-estate prices in Mumbai. 4. Lifting restrictions on congested corridors – The Bombay High Court recently upheld the Maharashtra State Government's policy on transfer of development rights (TDR) and lifted restrictions (earlier in place post a PIL filed by Bhagwanji Rayani) on constructions in certain corridors between the Western Express and Eastern Express Highways. TDR, a development right given to builders that surrender land to the Bombay Municipal Corp., has also been termed a "boon" for co-operative societies of old buildings. Following the introduction of TDR (in 1991) many suburban societies have given up their old structures to builders in return for larger flats in newer – and taller – buildings. The Bombay High Court's verdict effectively releases more area for development and is expected to cool off property prices in the suburbs. The jury's still out on whether this measure will bring down real-estate prices in the city, but don't expect to find too many believers here - TDR prices themselves rose 20% in a single day after the verdict. Going through these verdicts and Government decisions, one is tempted to see the builders smiling all the way to the bank. After all, this is a city known for its builder-politician nexus. One key issue is the kind of infrastructure that would be required to bear the burden of more houses, more families and more businesses. The MMRDA is already having a tough time meeting targets for its existing projects, so we'd rather not do any crystal-ball gazing on the impact of these new constructions on the city's infrastructure. However, no crystal-ball gazing is required to predict where property prices in Mumbai are headed. If recent deals are to be believed (for e.g ., the 3,000 sqft. 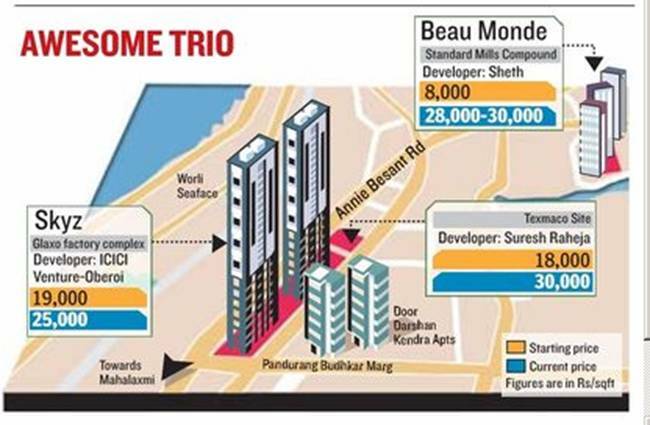 Cuffe Parade flat which went for Rs22crores, i.e. Rs73,000/sqft) the only way seems to be up. Technorati tags: India, Mumbai, housing, Real Estate, politics, Law, Government. A few days back, I had posted on the timeline of the riots which preceded the March 1993 Bombay Bomb Blasts. Today, in a sombre post, Sonia Faleiro recalls that history while talking about the recent July-06 blasts. In the aftermath of the bomb blasts, Mumbai’s Muslims feared a violent reprisal from the majority community, mirroring the riots of December 1992-January 1993. The riots followed the destruction of the Babri mosque in the city of Ayodhya by a mob led by Hindu fundamentalist leaders perpetrating the belief that the mosque was built on the birthplace of Lord Ram. The riots killed over 1,000 people, demarcating forever Mumbai’s people and places. Shortly after, on March 12, 1993, fifteen serial explosions, masterminded by members of the underworld and Islamic terror groups, struck Mumbai’s most famous landmarks including the Bombay Stock Exchange, killing 257 people. The blasts were believed to be payback for the riots. It is not surprising then, that after the attacks this July, Mumbai’s Muslim community was immediately on its guard. Back at the Hafta after ages. Couple of things here. This portal of the Jawarharlal Nehru National Urban Renewal Mission (JNNURM) came as a big surprise to me. The emphasis on urban reforms is really something. Besides the mandatory requirement for repealing acts like the ULCA, I was impressed by the emphasis given to citizen participation. Or should I really be surprised ? After all Ramesh Ramanathan of Janaagraha was the National Technical Advisor to the JNNURM. This piece appeared in the Hafta dated 23rd Oct 2006. Read the full article below. Comments welcome. After laying the foundation stone for the Mumbai Metro in July, Prime Minister, Dr. Manmohan Singh, returned to visit Mumbai last month to approve full Centre funding for the much-needed Brihanmumbai Storm Water Drainage (Brimstowad) project. Two large projects flagged off in three months, surely seems like a lot for a city that has waited decades for any infrastructure overhaul. While the Brimstowad report has been gathering dust since 1993, it came in the spotlight only after the 26th July 2005 deluge which exposed the weaknesses of the city’s ages-old drainage system. With the PM clearing the funding, work will finally kick-off on this ambitious Rs1,800cr project which will involve widening and deepening of four major underground drains in the island city and seven in western suburbs and eight in the eastern suburbs. But the work will also involve relief and rehabilitation (R&R) of 20,000 families, which itself will cost Rs600crores. This will be the State Government’s biggest challenge since it dare not repeat the debacle of the Mumbai Urban Transport Project (MUTP) R&R which resulted in the World Bank temporarily suspending funding for the MUTP project. While the State Government is basking in the glory of getting funding for the Brimstowad, their biggest challenge only lies ahead. They have yet to make any headway in procuring Centre approval for other vital projects for the city. However, and as things go for this city, a month down the line, nothing has moved forward. What’s worse is that the State Government and all its bureaucrats can’t even do a good job of submitting the required information to the Centre for getting critical funding for these projects under the Centre’s Jawaharlal Nehru National Urban Mission (JNNURM). It is indeed ironical that almost all the projects mentioned by the Prime Minister are ages old. They’ve been studied by various bodies like the BMC, MMRDA, etc as well as consultants over the years and yet, even today, the combined lot of the politicians and bureaucrats – also in charge of India’s financial capital – cannot prepare reports on these projects with the required details. (a) “Implementation of decentralisation measures as envisaged in 74th Constitutional Amendment Act. The State should ensure meaningful association and engagement of ULBs (urban local bodies) in planning the function of parastatal agencies as well as the delivery of services to the citizens. (b) *Repeal of Urban Land Ceiling Regulation Act (ULCRA). (c) *Reform of Rent Control Laws balancing the interests of landlords and tenants. (d) Rationalisation of Stamp Duty to bring it down to no more than 5 per cent within next seven years. (e) Enactment of the Public Disclosure Law to ensure preparation of medium-term fiscal plan of ULBs and parastatal agencies and release of quarterly performance information to all stakeholders. (f) Enactment of the Community Participation Law to institutionalise citizen’s participation and introduce the concept of the Area Sabha in urban areas. (g) Assigning or associating elected ULBs with “city planning function”. Over a period of seven years, transferring all special agencies that deliver civic services in urban areas to ULBs and creating accountability platforms for all urban civic service providers in transition. Phew. Surely, that’s a lot of change to digest for the ruling politicians. But like it or not, those changes are for real. Those changes will have to be made if the city has to be overhauled – and was there any doubt on that? Those changes will also involve managing the different people (vested interests?) affected by these large infrastructure projects in Mumbai. And therein lies the true test for the politicians. Meanwhile, its festive season and time for all the politicos to blow up their mugs and minimise God on party posters to wish all of us a Happy Diwali, Id or whatever. And yes, the BMC elections are also due soon. So, while the Congress is flaunting its achievements on its party posters across the city, it would do well to keep in mind that getting projects approved and funded is only a step, a step due for decades, in the right direction. Execution, however, will be another – and longer – story altogether. Technorati tags: India, Mumbai, Brimstowad, JNNURM, urban development, politics, Janaagraha. For those refered to in here, these are a few events that took place before 12th March 1993. July-92 to Dec-92 – Rallies, processions, etc held by the Sena, BJP, etc. across Bombay on the Ayodhya issue, mostly in communally sensitive areas. 6th December 1992 – The Babri Masjid is demolished. 26th December 1992 – Maha-aartis launched and continue till Feb-1993. 3rd January 1993 – Alleged MHADA officials survey Pratiksha Nagar, Antop Hill for Muslim residences. 5th January 1993 – Four Mathadi workers stabbed to death. 12th March 1993 - 10 bomb blasts across Bombay. 257 killed or missing and 713 injured. "Those who forget history are condemned to repeat it" - George Santayana. Today's HT carries this article citing various traffic experts who've pointed out flaws. “The bridge isn’t wide enough to cope with the traffic needs,” said IIT professor S.L. Dhingra, who has been associated with several infrastructure projects in Mumbai. Note that the earlier plan for the MTHL also had a rail component. In fact, the MSRDC's webpage on the project also states that the rail component will be added in Phase 2 of the project in 2015. However, the HT article states that this could be pushed away further. “The project will be incomplete without rail connectivity,” said independent traffic specialist Arun Mokashe who’s worked on several infrastructure projects. “To provide better connectivity to Greater Mumbai, the railway component is a must.” Another senior traffic consultant and former top MSRDC official said the plan “totally lacked foresight”. “In 1983, no one knew that a Special Economic Zone and an airport would come up in Panvel. So there is a serious need to rework the original blueprint,” he said. It does appear that the Government, in a hurry to make a big bang announcement on yet another large project, has completely missed out on the larger picture. As the experts in the article above have pointed out, Mumbai and Navi Mumbai will be completely different cities when the MTHL finally gets constructed, thanks to the proposed SEZ and new international airport. Both projects can only raise the traffic numbers for the MTHL. Hence, any blueprint has to keep this in mind rather than base work on 30 or 40 year old transport studies. If these issues (i.e. more lanes, an organised dispersal and the rail component) are not integrated within the project at the start, it could well be another case of short-sighted planning that leads to problems in the longer term. Case in point - the Bandra Worli Sealink, which will be completed before the Worli-Nariman Point link is built, and could hence result in traffic building up on Haji Ali (for more on this also read our interview with architect, Chandrashekhar Prabhu). Woodrow Wilson Memorial Bridge was blown up last night by Washington city officials to make way for a new version. What's interesting was that the button was pressed - or rather, the plunger was pushed - not by a politician or civil servant or a leader, but by 53-year old Dan Ruefly, a veteran user of the bridge. "What an honor," said Mr. Ruefly, 53, who won a contest sponsored by the Woodrow Wilson Bridge Project to find the motorist with the worst bridge-related commuting story. As the winner, he got to trigger last night's detonation of 2,600 tons of steel. "It was great to be able to do this for all of those commuters who have sat on that bridge. It was worth the wait." I'm sure we won't run out of any such road stretches that are the "banes of many commuters" but I'm also sure it will take many more dislocated backs and shattered hip bones to get rid of them. Till then, laage raho BMC. Can Ministers "guard" Mumbai ? There's this hoarding on Marine Drive, just under the flyover and near the petrol pump after the Mumbai Police Gym ground. It's a Nationalist Congress Party ad congratulating the appointment of Shri Jayant Patil as the "Guardian Minister" of Mumbai. Yes, you got that right. Our city has a Guardian Minister. As if the efforts of our Mayor weren't enough we now have a Minister to guard over us. So - who is Jayant Patil ? No less than the Finance Minister of the state of Maharashtra. Check out his bio here. What will Shri Patil guard us against ? Bad roads ? corruption ? crowded trains and roads ? rising property prices ? or terrorism ? Could someone please show me the responsibilities of such a Minister ? And who is he accountable to ? Does he have a list of priorities ? Or, like the CM, will he just reiterate the..er..importance of the..um.. completion of projects like the MUTP, Mumbai Metro, etc to address the woes of Mumbai ? - Visited the BMC HQ. And was reminded by the Sena-run BMC that the Maharashtra State Govt (run by Congress+NCP) owes the BMC dues worth Rs579cr. Ah..politics. - Promised Slum rehab. Can't a resist a quote he's given there "We are striving to improve citizens’ standard of living and give them basic amenities." - Finally an agenda. For brevity sakes, we reduce it to one line and leave the rest to the BMC, MMRDA, BEST, ABC, XYZ and the other acronyms responsible for improving our standard of living. Now here's another interesting aspect to this issue. Shri Chandrakant Handore is the Guardian Minister for Mumbai Suburban District (links here, here and this one here which..er..has him named in a gangster tape). So does he report to the Guardian Minister ? And in case you were wondering who were the earlier Guardian Ministers for Mumbai, before Mr. Patil, there was a certain Ramraje Naik Nimbalkar. And before both of them, there was none other than Chhagan Bhujbal himself. This seems to be another case of all hype and no substance. After the Sheriff and the Mayor, surely this is another case of meaningless designations, posts without responsibilities or accountability. And then again, it looks like a sop, a sweetener, given to the NCP in return for their support to the Congress so that both can rule Maharashtra - and hence Mumbai. Yet again, the politicians looking after themselves under what seems to be a random attempt to guard the city. of absence from blogging due to unavoidable reasons. Back in the sphere after about 10 days. That's an alternative full form for Mumbai Urban Transport Project - or MUTP. My piece on this ambitious project appeared in yesterday's Hafta. Reproduced below. It all began in 1962. The year in which LA-based M/S Wilbur Smith prepared a detailed road transport plan for Mumbai. Proposals in this report included construction of freeway networks – primarily the Bandra-Nariman Point and Sewri-Nhava Seva links. The Wilbur Smith study was also supplemented by a Mass Transportation Study in 1967-68 whose proposals included construction of underground rail network. Interestingly enough, soon after this study, a Regional Plan in 1973, highlighted the fact that expensive projects like freeways and metros would become necessary as long as economic activity in South Mumbai continued to rise and get concentrated. The study reiterated the need for a Bandra-Kurla Complex and a Navi Mumbai. So, what happened to all the proposals and recommendations from these ages-old studies and reports ? Some were completed (Nhava Seva Port), some given up (a rapid transit system), some taken up in the BUTP and the MUTP (read ahead), some currently being implemented (the Bandra Worli Sealink), one big one whose foundation stone was laid a couple of months back (Mumbai Metro) and one whose tender will be awarded this year (Mumbai Transharbour Sea link). Indeed, infrastructure upgrades in Mumbai have had a long, chequered past. Post the formation of the MMRDA in 1975, the first major transport overhaul achieved for the city was the Bombay Urban Transport Project (BUTP). Implemented between March-77 and June-84, the projects achievements included addition of 700 buses and three bus depots for the BEST and construction of five flyovers and road-widening projects across the city. Cost of the project? All of Rs40cr, or US$50m (at the then rate of Rs7.94/$), half of which – or US$25m – was funded by the World Bank. Almost 20 years later, the Mumbai Urban Transport Project (MUTP), is being implemented at a cost of Rs4,526cr – just under a billion dollars – again half of which (US$542m) will be funded by the World Bank. Needless to say, it’s the most ambitious infrastructure upgrade ever undertaken for this city, and will be implemented by no less than five different agencies – the MMRDA, the Mumbai. Rail Vikas Corp., MSRDC, BEST, and of course our very own BMC. The rail component (Rs3,510cr) of MUTP includes addition of lines between Mahim-Borivali, Kurla-Thane and Borivali-Virar. The road component (Rs1,016cr) includes large projects like the Jogeshwari-Vikhroli Link Road and the Santacruz-Chembur Link road. Expectedly, controversy and delay has dogged the MUTP from day one. While the preparatory work for the MUTP was conducted in 1988, World Bank funding for the project came through fourteen-years later in 2002. However, the biggest challenge to the MUTP remains the issue of relief and rehabilitation (R&R) of people affected by this massive project (PAP) – or the 19,128 families, as per the MMRDA’s own web page on the MUTP. The total cost of R&R is pegged at about Rs480cr (included in the overall project cost) and as per the Government of Maharashtra’s R&R rules, each project affected family is entitled to get a tenement of 225sq. ft, free of cost. In case of urgent shifting, transit accommodation of 125sq. ft with all basic amenities is to be provided to the PAP. World Bank norms also require all PAP to be resettled before any the start of engineering work. Over April and December 2004, the independent Inspection Panel of the World Bank received four separate requests for inspection from organisations representing residents and shop-owners in Kurla and Jogeshwari. The Inspection Panel then investigated these requests and issued a report in Dec-2005. To quote from the World Bank’s website - “The Panel found that the Bank did not comply with a number of requirements under its own policies. Among other things, the Panel found that the Bank overlooked the needs of low and middle-income shopkeepers, did not consult with them in the selection of resettlement sites, and did not ensure that suitable arrangements were provided for their resettlement. The originally proposed resettlement sites posed difficulties for many shopkeepers in restoring their businesses and maintaining incomes, as confirmed in a recent Business Needs Study launched under the Project. The Project also failed to give adequate attention to the employees of the displaced shops, who faced risks of income loss. While the road and R&R components of the MUTP have their own share of hurdles to face, the rail component is not seeing a smooth ride. Newspaper reports indicate that the Railway Ministry and the Maharashtra Government are in a bind over who would bear the cost of the project. As for the Mumbai Rail Vikas Corp – one of the implementing agencies for the rail component of the MUTP – it seems to be in a state of limbo. A plea filed by Borivali resident Devraj Roy, under the Right to Information Act, revealed that precious little has been achieved so far (2% to be precise on some projects), target dates have been extended even as railway officials ran up foreign travel bills running into lakhs. Even as chaos reigns over the billion-dollar MUTP there is no immediate respite in sight for the Mumbaikars manifold commuting woes. 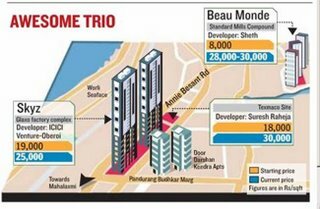 MUTP itself is targeting 2008 for completion, as is the Bandra-Worli Sea Link. The Trans Harbour Link is yet to find a contractor and don’t even think about the Metro (2020). We’re six years away from the 50th anniversary of the Wlibur Smith study on Mumbai’s roads and have barely anything to show in terms of progress on any of these 30-40-50 year old projects. Indeed, a grim reminder that Mumbaikars have borne too many todays and are yet to see a better tomorrow. 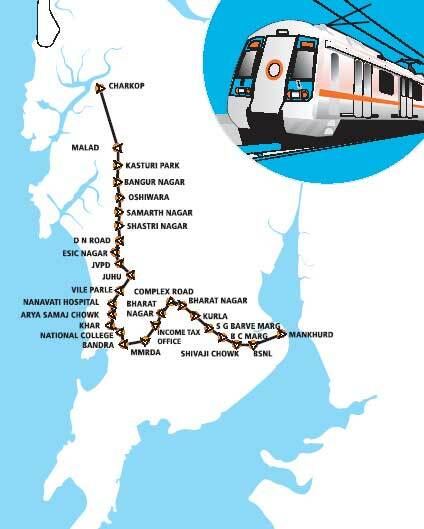 Nearly 40 years in the making, the Sewri-Nhava Seva Trans-harbour link (MTHL) seems to be finally taking off. After first receiving State Government approval in 2001, the MTHL then issued pre-bid documents in early 2004 and received Central Government approval in Dec-2004. In fact, the Finance Minister also mentioned the link in his Budget-2005 speech and the project also received Environmental clearance in March 2005. But work till date ? Nil. Now, in Aug-2006, the MSRDC is finally focusing on the MTHL, and, more importantly, has given out bidding documents for this link. And finally - when will it get completed ? 4 years after work begins. And work begins six months after the order is awarded (i.e. June-2007). Which means around mid-2011. Just in time to celebrate the 50th anniversary of it's inception. Talk about labour pain. It’s tough to reconcile this, so do help me out. Today’s HT on its front page carries a photo of Shweta and Vijaya Futane – wife and mother of office-boy and MBA-aspirant Yogesh Futane who died in the Mumbai train blasts. Both of them now pack greeting cards, earning Rs2 per stack. Do you get that ? The wife and mother of a bomb blast victim. They have to pack greeting cards now for a living. Then there’s this photo of another victim with his right hand cut off. The title of the article is “How will I fund my daughter’s education?”. That’s Dhiraj Rathod. The blasts cost him his right forearm. There’s much more inside the paper, and much more you’d read anyways. And then last night there was this TV interview. Karan Thapar doing a “Devil’s Advocate” with Mr. M. K. Narayanan, our National Security Advisor. "Karan Thapar: So what’s happening in India is part of a series of events worldwide? M K Narayanan: Partly worldwide. But, in this case partly India based. What I am saying is that 7/11 is not an isolated incident in Mumbai and you can forget about it. It’s part of a larger pattern. And I say that is important because the people who are responsible for what is taking place, are today a new band of what I would call, a international fanatic group, and their objectives are not always very clear. But, the final goal is obvious. Let’s come to Mumbai and why do we say that the LeT is involved. When you have a smoking gun, it’s obvious. When you don’t have a smoking gun, that’s where I suppose intelligence agencies have to be reasonably sophisticated, if I might use the term. You may disagree. But, I think it is a combination of intelligence, ground facts, ground realities and very importantly deductive and inductive logic as to how do you arrive at this logic. Now if in the case of Mumbai blasts, the first important fact is that you cannot have an event of this kind unless you have a certain number of modules, which are available. We have the information that in Maharashtra, in places like Aurangabad and I’m only talking of Maharashtra, but it’s equally true to extent of Gujarat and also true to Andhra Pradesh or Hyderabad and a couple of other places and there are modules available. Some are known, some are suspected and unfortunately we do not know some. We are aware and we have been tracking modules and it’s because of that the Aurangabad incident could take place. So the first necessity for an event of this kind was the existence of a LeT module, which exists. The second one is that you take the explosives for instance, one of course in ammonium nitrate that is a common explosive, but there are traces of RDX involved also. It has been possible to establish some kind of connectivity, I don’t know if you can have a proof on that, between the RDX that was used there and some of the RDX that we missed out now in the Aurangabad incident, known as the LeT event. The third item is with regard to the generic pattern of LeT activities. This is where the deductive and inductive logic comes out, in which what are their targets, what have they achieved, it’s not as if they have wasted their resources like some of the other groups. There is a pattern that’s available – the fingerprints and the footprints of these organisations. Karan Thapar: Can I suggest something? All of this is putting together - the facts available, inductive and deductive, some of it is suggestive, some of it is corroborative, to Indians this is convincing because we in a sense want to believe it. But the problem is that the world outside is doubtful. They say at best it’s suggestive. M K Narayanan: I have not completed. Finally where do the instructions come from? Now that’s where electronic intelligence comes in. Sometimes you have people picked up. The investigations for the Mumbai blast are still on. I don’t want it derailed. We have a couple of foreign nationals, who are under interrogations. We are hopeful that the connections will then be enough to prove to the rest of the world. I think the proof as far as we are concerned is fairly obvious. I would also like to tell you that there are three or four names which constantly come up when you look at these LeT modules, the controllers in Pakistan for instance - Asim Cheema, Alkama. I don’t want to reveal everything we know about how the linkages work. There is connectivity about how the people have come in, how some of them come in through Nepal, how they are tracked. Sometimes they are lost, sometimes we don’t know about them. But, that is the kind of thing you put together and finally when we do that, it should be enough to convince any rational person who is looking at a terrorist conspiracy, which is directed to against India. If you don’t want to believe it, then it becomes much more difficult. " (2) we have proof of LeT modules in Aurangabad. (4) It's "fairly obvious" where the instructions for this blast came from. And how conclusive is this proof ? This reply came as a shocker to me. "Karan Thapar: Is the sort of proof that you have as good as the sort of proof America had against the Taliban and against Afghanistan when it acted in 2001? M. K. Narayanan: I think what we have at this point is definitely stronger than what America had when 9/11 took place or immediately thereafter. Since then, they have got a little more information. But the question then again is -- are you willing to believe it? If you’re willing to believe it, I think we will provide the same kind of story." So, here’s the part I don’t get. The one person advising the Prime Minister on security seems reasonably convinced that Pakistan was behind 7/11. Why the hell are we as a country not doing anything about it? Don’t we have any responsibility whatsoever to the victims of the blasts, and their families? Their families. The same families who are now reduced to stacking greeting cards, earning Rs2 per stack. Because their sons and their husbands were killed in the bomb blasts. The same bomb blasts which, we believe, were carried out under instructions from Pakistan. The same Pakistan, who is secure in the knowledge that it has US support. The same US, whose Asst. Security of State says that we need to come up with evidence on the blasts. And the same US who went to war after 9/11 against the Taliban, saying and proving that the Taliban did it. The same proof that we believe is weaker than the proof we have in the 7/11 Mumbai train bombings. And we still do nothing ? It’s tough to reconcile this. Do help me out. Mumbai lost 546 people to 944mm of rains and flood-related disasters. That number includes 75 killed in landslides and another 179 that drowned in floods. (that toll is as per BMC’s own affidavit). Considering that we’ve barely come out of the 7/11 train bomb blasts, it’s a tall order to remember those who died a year back on this day. And 546 is a huge number. One year down the line, and barely anything’s changed in the city. We’ve already had grim reminders in this monsoon that the city remains vulnerable. The Maharashtra Government had constituted the Madhav Chitale Committee to investigate 26/7. The report was approved on May 24th, 2006 and the Government continues to "take action" on the report's recommendation, leave alone taking to task those responsible for the collapse in the city's infrastructure. There was also a Concerned Citizens Commission, headed by Justice P. B. Sawant, formed in Sept-05 which was supposed to have submitted its report within three months. While I’ve not read much about this Commission, I’d be glad if someone can forward me a copy of this report. Somehow, I can’t get myself to call tomorrow an “anniversary”. How can disasters have anniversaries? We will remember 26/7 tomorrow. The media will ensure it. And then, as it does for all things Mumbai, everything will die down and things will get back to what we con ourselves to call “normalcy”. That normalcy is something I don’t buy for a minute. I wish there was something more permanent to remind us of these disasters (including obviously the train blasts and other dark events this city has seen) and their tolls on human life. I agree with Govind when he says today that “grief as expressed in permanent memorials may be a powerful emotion”. Towards this I also thank (and agree with) Dilip on his “Never Forget” initiative. And so, before we forget, here’s that BMC number again. 546 dead, in Mumbai, due to 26/7. Currently traveling and regular programing to resume in a week's time. 3. that tech guru Amit Agarwal, who - again as expected - has a list of answers to the various how-to's. At 2.32am, per TV channels, 163 dead. 11 minutes, 7 blasts. At 2.32am, per TV channels, Western Railway's locals between Churchgate-Bandra, Vasai-Virar and other routes have started functioning. I've just come back home after seeing scores of people on the road offering bottled water, parle-g biscuits and even cooked meals in small packets to each and every vehicle they can stretch their hand to. They were everywhere. And they're still there as I type this. My thanks to that awesome lot at Mumbai Help for making those calls. Bloggers - you rock. Awesome work. Head over to Desipundit for their sticky post on 11/7. "I over-reacted" – Bill to Beatrix Kiddo when she finally hunts him down in Kill Bill 2*. "What else could they have done?" Sena MP, Madhukar Sarpotdar, answering to NDTV’s Sreenavasan Jain’s question on why the Shiv Sainiks reacted violently in Bombay after the statue of Meenatai Thackeray, the late wife of Sena Supremo, Balasaheb Thackeray was desecrated. …And here now, is my picture of the day (Courtesy: TOI). Guess who is the circled man in that photo? He’s the mayor of Mumbai – Datta Dalvi. 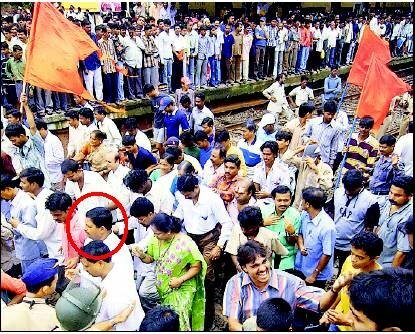 He’s seen leading protesting Shiv Sainiks staging a “rail roko” at Vikhroli Railway Station. That’s right. Welcome to Mumbai. Where the mayor of the city steps out of his home on a Sunday morning, gets down on the rail tracks and leads protestors to stop trains. The mayor of the city. Shiv Sena’s leaders have done it again. While Mr. Sarpotdar’s statement to Mr. Jain should come as no surprise (given his illustrious background in the 1993 riots), the Mayor of the city coming out personally to stop trains comes as a neat slap on the face for Mumbaikars. The same Mayor, who states "Mumbai City is known not only as the capital city of Maharashtra State, but also as the Urbs Prima in Indis, or the Premier City of India." as he pens the foreword for the one prime agency under his control – the Municipal Corporation of Greater Mumbai. Forget solving the problems of the city, forget leading the BMC, forget even chilling at home on a Sunday. The Mayor of the city believes that as a Sena leader he has been given the right to stop trains from functioning because the statue of his Supremo’s wife was desecrated. All this is happening in 2006. In Bombay – the Premier City of India. The least they can do is remove “The Honourable” part when they address the Mayor. * - That's Bill's answer to Beatrix when she asks him why he, along with the Deadly Vipers, had wiped out all her friends and to-be family at her wedding.